This article is about the dwarf planet. For the deity, see Pluto (mythology). For other uses, see Pluto (disambiguation). In the 1840s, Urbain Le Verrier used Newtonian mechanics to predict the position of the then-undiscovered planet Neptune after analyzing perturbations in the orbit of Uranus. Subsequent observations of Neptune in the late 19th century led astronomers to speculate that Uranus's orbit was being disturbed by another planet besides Neptune. In 1906, Percival Lowell—a wealthy Bostonian who had founded Lowell Observatory in Flagstaff, Arizona, in 1894—started an extensive project in search of a possible ninth planet, which he termed "Planet X". By 1909, Lowell and William H. Pickering had suggested several possible celestial coordinates for such a planet. Lowell and his observatory conducted his search until his death in 1916, but to no avail. Unknown to Lowell, his surveys had captured two faint images of Pluto on March 19 and April 7, 1915, but they were not recognized for what they were. There are fourteen other known precovery observations, with the earliest made by the Yerkes Observatory on August 20, 1909. Percival's widow, Constance Lowell, entered into a ten-year legal battle with the Lowell Observatory over her husband's legacy, and the search for Planet X did not resume until 1929. 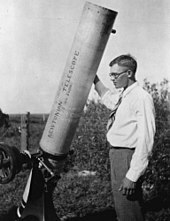 Vesto Melvin Slipher, the observatory director, gave the job of locating Planet X to 23-year-old Clyde Tombaugh, who had just arrived at the observatory after Slipher had been impressed by a sample of his astronomical drawings. Tombaugh's task was to systematically image the night sky in pairs of photographs, then examine each pair and determine whether any objects had shifted position. Using a blink comparator, he rapidly shifted back and forth between views of each of the plates to create the illusion of movement of any objects that had changed position or appearance between photographs. On February 18, 1930, after nearly a year of searching, Tombaugh discovered a possible moving object on photographic plates taken on January 23 and 29. A lesser-quality photograph taken on January 21 helped confirm the movement. After the observatory obtained further confirmatory photographs, news of the discovery was telegraphed to the Harvard College Observatory on March 13, 1930. Pluto has yet to complete a full orbit of the Sun since its discovery because one Plutonian year is 247.68 years long. The name Pluto, after the god of the underworld, was proposed by Venetia Burney (1918–2009), an eleven-year-old schoolgirl in Oxford, England, who was interested in classical mythology. She suggested it in a conversation with her grandfather Falconer Madan, a former librarian at the University of Oxford's Bodleian Library, who passed the name to astronomy professor Herbert Hall Turner, who cabled it to colleagues in the United States. Most languages use the name "Pluto" in various transliterations. [h] In Japanese, Houei Nojiri suggested the translation Meiōsei (冥王星, "Star of the King (God) of the Underworld"), and this was borrowed into Chinese, Korean, and Vietnamese (which instead uses "Sao Diêm Vương", which was derived from the Chinese term 閻王 (Yánwáng), as "minh" is a homophone for the Sino-Vietnamese words for "dark" (冥) and "bright" (明)). Some Indian languages use the name Pluto, but others, such as Hindi, use the name of Yama, the God of Death in Hindu and Buddhist mythology. Polynesian languages also tend to use the indigenous god of the underworld, as in Māori Whiro. From 1992 onward, many bodies were discovered orbiting in the same volume as Pluto, showing that Pluto is part of a population of objects called the Kuiper belt. This made its official status as a planet controversial, with many questioning whether Pluto should be considered together with or separately from its surrounding population. Museum and planetarium directors occasionally created controversy by omitting Pluto from planetary models of the Solar System. The Hayden Planetarium reopened—in February 2000, after renovation—with a model of only eight planets, which made headlines almost a year later. As objects increasingly closer in size to Pluto were discovered in the region, it was argued that Pluto should be reclassified as one of the Kuiper belt objects, just as Ceres, Pallas, Juno and Vesta lost their planet status after the discovery of many other asteroids. 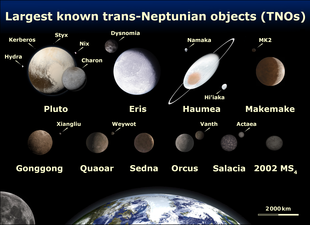 On July 29, 2005, astronomers at Caltech announced the discovery of a new trans-Neptunian object, Eris, which was substantially more massive than Pluto and the most massive object discovered in the Solar System since Triton in 1846. Its discoverers and the press initially called it the tenth planet, although there was no official consensus at the time on whether to call it a planet. Others in the astronomical community considered the discovery the strongest argument for reclassifying Pluto as a minor planet. Pluto fails to meet the third condition. Its mass is substantially less than the combined mass of the other objects in its orbit: 0.07 times, in contrast to Earth, which is 1.7 million times the remaining mass in its orbit (excluding the moon). The IAU further decided that bodies that, like Pluto, meet criteria 1 and 2, but do not meet criterion 3 would be called dwarf planets. In September 2006, the IAU included Pluto, and Eris and its moon Dysnomia, in their Minor Planet Catalogue, giving them the official minor planet designations "(134340) Pluto", "(136199) Eris", and "(136199) Eris I Dysnomia". Had Pluto been included upon its discovery in 1930, it would have likely been designated 1164, following 1163 Saga, which was discovered a month earlier. There has been some resistance within the astronomical community toward the reclassification. Alan Stern, principal investigator with NASA's New Horizons mission to Pluto, derided the IAU resolution, stating that "the definition stinks, for technical reasons". Stern contended that, by the terms of the new definition, Earth, Mars, Jupiter, and Neptune, all of which share their orbits with asteroids, would be excluded. He argued that all big spherical moons, including the Moon, should likewise be considered planets. He also stated that because less than five percent of astronomers voted for it, the decision was not representative of the entire astronomical community. Marc W. Buie, then at the Lowell Observatory petitioned against the definition. Others have supported the IAU. Mike Brown, the astronomer who discovered Eris, said "through this whole crazy circus-like procedure, somehow the right answer was stumbled on. It's been a long time coming. Science is self-correcting eventually, even when strong emotions are involved." Public reception to the IAU decision was mixed. Many accepted the reclassification, but some sought to overturn the decision with online petitions urging the IAU to consider reinstatement. A resolution introduced by some members of the California State Assembly facetiously called the IAU decision a "scientific heresy". The New Mexico House of Representatives passed a resolution in honor of Tombaugh, a longtime resident of that state, that declared that Pluto will always be considered a planet while in New Mexican skies and that March 13, 2007, was Pluto Planet Day. The Illinois Senate passed a similar resolution in 2009, on the basis that Clyde Tombaugh, the discoverer of Pluto, was born in Illinois. The resolution asserted that Pluto was "unfairly downgraded to a 'dwarf' planet" by the IAU." Some members of the public have also rejected the change, citing the disagreement within the scientific community on the issue, or for sentimental reasons, maintaining that they have always known Pluto as a planet and will continue to do so regardless of the IAU decision. Researchers on both sides of the debate gathered in August 2008, at the Johns Hopkins University Applied Physics Laboratory for a conference that included back-to-back talks on the current IAU definition of a planet. Entitled "The Great Planet Debate", the conference published a post-conference press release indicating that scientists could not come to a consensus about the definition of planet. In June 2008, the IAU had announced in a press release that the term "plutoid" would henceforth be used to refer to Pluto and other objects that have an orbital semi-major axis greater than that of Neptune and enough mass to be of near-spherical shape. Pluto was discovered in 1930 near the star δ Geminorum, and merely coincidentally crossing the ecliptic at this time of discovery. Pluto moves about 7 degrees east per decade with small apparent retrograde motion as seen from Earth. Pluto was closer to the Sun than Neptune between 1979 and 1999. Pluto's orbital period is currently about 248 years. Its orbital characteristics are substantially different from those of the planets, which follow nearly circular orbits around the Sun close to a flat reference plane called the ecliptic. In contrast, Pluto's orbit is moderately inclined relative to the ecliptic (over 17°) and moderately eccentric (elliptical). This eccentricity means a small region of Pluto's orbit lies closer to the Sun than Neptune's. The Pluto–Charon barycenter came to perihelion on September 5, 1989,[i] and was last closer to the Sun than Neptune between February 7, 1979, and February 11, 1999. In the long term, Pluto's orbit is chaotic. Computer simulations can be used to predict its position for several million years (both forward and backward in time), but after intervals longer than the Lyapunov time of 10–20 million years, calculations become speculative: Pluto is sensitive to immeasurably small details of the Solar System, hard-to-predict factors that will gradually change Pluto's position in its orbit. The semi-major axis of Pluto's orbit varies between about 39.3 and 39.6 au with a period of about 19,951 years, corresponding to an orbital period varying between 246 and 249 years. The semi-major axis and period are presently getting longer. Orbit of Pluto – ecliptic view. 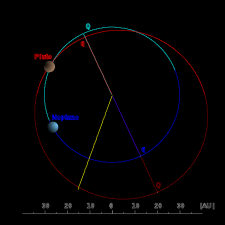 This "side view" of Pluto's orbit (in red) shows its large inclination to the ecliptic. Orbit of Pluto – polar view. This "view from above" shows how Pluto's orbit (in red) is less circular than Neptune's (in blue), and how Pluto is sometimes closer to the Sun than Neptune. The darker sections of both orbits show where they pass below the plane of the ecliptic. Despite Pluto's orbit appearing to cross that of Neptune when viewed from directly above, the two objects' orbits are aligned so that they can never collide or even approach closely. The two orbits do not intersect. When Pluto is closest to the Sun, and hence closest to Neptune's orbit as viewed from above, it is also the farthest above Neptune's path. Pluto's orbit passes about 8 AU above that of Neptune, preventing a collision. This alone is not enough to protect Pluto; perturbations from the planets (especially Neptune) could alter Pluto's orbit (such as its orbital precession) over millions of years so that a collision could be possible. However, Pluto is also protected by its 2:3 orbital resonance with Neptune: for every two orbits that Pluto makes around the Sun, Neptune makes three. Each cycle lasts about 495 years. This pattern is such that, in each 495-year cycle, the first time Pluto is near perihelion, Neptune is over 50° behind Pluto. By Pluto's second perihelion, Neptune will have completed a further one and a half of its own orbits, and so will be nearly 130° ahead of Pluto. Pluto and Neptune's minimum separation is over 17 AU, which is greater than Pluto's minimum separation from Uranus (11 AU). The minimum separation between Pluto and Neptune actually occurs near the time of Pluto's aphelion. The 2:3 resonance between the two bodies is highly stable and has been preserved over millions of years. This prevents their orbits from changing relative to one another, and so the two bodies can never pass near each other. Even if Pluto's orbit were not inclined, the two bodies could never collide. The long term stability of the mean-motion resonance is due to phase protection. If Pluto's period is slightly shorter than 3/2 of Neptune, its orbit relative to Neptune will drift, causing it to make closer approaches behind Neptune's orbit. The strong gravitational pull between the two causes angular momentum to be transferred to Pluto, at Neptune's expense. This moves Pluto into a slightly larger orbit, where it travels slightly more slowly, according to Kepler's third law. After many such repetitions, Pluto is sufficiently slowed, and Neptune sufficiently sped up, that Pluto orbit relative to Neptune drifts in the opposite direction until the process is reversed. The whole process takes about 20,000 years to complete. Numerical studies have shown that over millions of years, the general nature of the alignment between the orbits of Pluto and Neptune does not change. There are several other resonances and interactions that enhance Pluto's stability. These arise principally from two additional mechanisms (besides the 2:3 mean-motion resonance). First, Pluto's argument of perihelion, the angle between the point where it crosses the ecliptic and the point where it is closest to the Sun, librates around 90°. This means that when Pluto is closest to the Sun, it is at its farthest above the plane of the Solar System, preventing encounters with Neptune. This is a consequence of the Kozai mechanism, which relates the eccentricity of an orbit to its inclination to a larger perturbing body—in this case Neptune. Relative to Neptune, the amplitude of libration is 38°, and so the angular separation of Pluto's perihelion to the orbit of Neptune is always greater than 52° (90°–38°). The closest such angular separation occurs every 10,000 years. In 2012, it was hypothesized that 15810 Arawn could be a quasi-satellite of Pluto, a specific type of co-orbital configuration. According to the hypothesis, the object would be a quasi-satellite of Pluto for about 350,000 years out of every two-million-year period. Measurements made by the New Horizons spacecraft in 2015 made it possible to calculate the orbit of Arawn more accurately. These calculations confirm the overall dynamics described in the hypothesis. However, it is not agreed upon among astronomers whether Arawn should be classified as a quasi-satellite of Pluto based on this motion, since its orbit is primarily controlled by Neptune with only occasional smaller perturbations caused by Pluto. Pluto's rotation period, its day, is equal to 6.39 Earth days. Like Uranus, Pluto rotates on its "side" in its orbital plane, with an axial tilt of 120°, and so its seasonal variation is extreme; at its solstices, one-fourth of its surface is in continuous daylight, whereas another fourth is in continuous darkness. The reason for this unusual orientation has been debated. Research from the University of Arizona has suggested that it may be due to the way that a body's spin will always adjust to minimise energy. This could mean a body reorienting itself to put extraneous mass near the equator and regions lacking mass tend towards the poles. This is called polar wander. According to a paper released from the University of Arizona, this could be caused by masses of frozen nitrogen building up in shadowed areas of the dwarf planet. These masses would cause the body to reorient itself, leading to its unusual axial tilt of 120°. The buildup of nitrogen is due to Pluto's vast distance from the Sun. At the equator, temperatures can drop to −240 °C (−400.0 °F; 33.1 K), causing nitrogen to freeze as water would freeze on Earth. The same effect seen on Pluto would be observed on Earth if the Antarctic ice sheet was several times larger. The plains on Pluto's surface are composed of more than 98 percent nitrogen ice, with traces of methane and carbon monoxide. Nitrogen and carbon monoxide are most abundant on the anti-Charon face of Pluto (around 180° longitude, where Tombaugh Regio's western lobe, Sputnik Planitia, is located), whereas methane is most abundant near 300° east. The mountains are made of water ice. Pluto's surface is quite varied, with large differences in both brightness and color. Pluto is one of the most contrastive bodies in the Solar System, with as much contrast as Saturn's moon Iapetus. The color varies from charcoal black, to dark orange and white. Pluto's color is more similar to that of Io with slightly more orange and significantly less red than Mars. 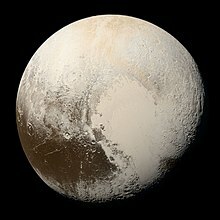 Notable geographical features include Tombaugh Regio, or the "Heart" (a large bright area on the side opposite Charon), Cthulhu Macula, or the "Whale" (a large dark area on the trailing hemisphere), and the "Brass Knuckles" (a series of equatorial dark areas on the leading hemisphere). −40000 years. The New Horizons science team summarized initial findings as "Pluto displays a surprisingly wide variety of geological landforms, including those resulting from glaciological and surface–atmosphere interactions as well as impact, tectonic, possible cryovolcanic, and mass-wasting processes." In Western parts of Sputnik Planitia there are fields of transverse dunes formed by the winds blowing from the center of Sputnik Planitia in the direction of surrounding mountains. The dune wavelengths are in the range of 0.4–1 km and they are likely consists of methane particles 200–300 μm in size. Pluto's density is 7003186000000000000♠1.860±0.013 g/cm3. 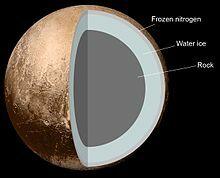 Because the decay of radioactive elements would eventually heat the ices enough for the rock to separate from them, scientists expect that Pluto's internal structure is differentiated, with the rocky material having settled into a dense core surrounded by a mantle of water ice. The diameter of the core is hypothesized to be approximately 7006170000000000000♠1700 km, 70% of Pluto's diameter. It is possible that such heating continues today, creating a subsurface ocean of liquid water 100 to 180 km thick at the core–mantle boundary. In September 2016, scientists at Brown University simulated the impact thought to have formed Sputnik Planitia, and showed that it might have been the result of liquid water upwelling from below after the collision, implying the existence of a subsurface ocean at least 100 km deep. Pluto has no magnetic field. Pluto's diameter is 7006237660000000000♠2376.6±3.2 km and its mass is 7022130299999999999♠(1.303±0.003)×1022 kg, 17.7% that of the Moon (0.22% that of Earth). Its surface area is 7013177900000000000♠1.779×107 km2, or roughly the same surface area as Russia. Its surface gravity is 0.063 g (compared to 1 g for Earth). Pluto is more than twice the diameter and a dozen times the mass of the dwarf planet Ceres, the largest object in the asteroid belt. It is less massive than the dwarf planet Eris, a trans-Neptunian object discovered in 2005, though Pluto has a larger diameter of 2376.6 km compared to Eris's approximate diameter of 2326 km. Determinations of Pluto's size had been complicated by its atmosphere, and hydrocarbon haze. In March 2014, Lellouch, de Bergh et al. published findings regarding methane mixing ratios in Pluto's atmosphere consistent with a Plutonian diameter greater than 2360 km, with a "best guess" of 2368 km. On July 13, 2015, images from NASA's New Horizons mission Long Range Reconnaissance Imager (LORRI), along with data from the other instruments, determined Pluto's diameter to be 2,370 km (1,470 mi), which was later revised to be 2,372 km (1,474 mi) on July 24, and later to 7006237400000000000♠2374±8 km. Using radio occultation data from the New Horizons Radio Science Experiment (REX), the diameter was found to be 7006237660000000000♠2376.6±3.2 km. A near-true-color image taken by New Horizons after its flyby. Numerous layers of blue haze float in Pluto's atmosphere. Along and near the limb, mountains and their shadows are visible. Image of Pluto in X-rays by Chandra X-ray Observatory (blue spot). The X-rays are probably created by interaction of the gases surrounding Pluto with solar wind, although details of their origin are not clear. Pluto has a tenuous atmosphere consisting of nitrogen (N2), methane (CH4), and carbon monoxide (CO), which are in equilibrium with their ices on Pluto's surface. According to the measurements by New Horizons, the surface pressure is about 1 Pa (10 μbar), roughly one million to 100,000 times less than Earth's atmospheric pressure. It was initially thought that, as Pluto moves away from the Sun, its atmosphere should gradually freeze onto the surface; studies of New Horizons data and ground-based occultations show that Pluto's atmospheric density increases, and that it likely remains gaseous throughout Pluto's orbit. New Horizons observations showed that atmospheric escape of nitrogen to be 10,000 times less than expected. Alan Stern has contended that even a small increase in Pluto's surface temperature can lead to exponential increases in Pluto's atmospheric density; from 18 hPa to as much as 280 hPa (three times that of Mars to a quarter that of the Earth). At such densities, nitrogen could flow across the surface as liquid. Just like sweat cools the body as it evaporates from the skin, the sublimation of Pluto's atmosphere cools its surface. The presence of atmospheric gases was traced up to 1670 kilometers high; the atmosphere does not have a sharp upper boundary. Pluto has five known natural satellites. The closest to Pluto is Charon. First identified in 1978 by astronomer James Christy, Charon is the only moon of Pluto in hydrostatic equilibrium; Charon's mass is sufficient to cause the barycenter of the Pluto–Charon system to be outside Pluto. Beyond Charon there are four much smaller circumbinary moons. In order of distance from Pluto they are Styx, Nix, Kerberos, and Hydra. Nix and Hydra were both discovered in 2005, Kerberos was discovered in 2011, and Styx was discovered in 2012. 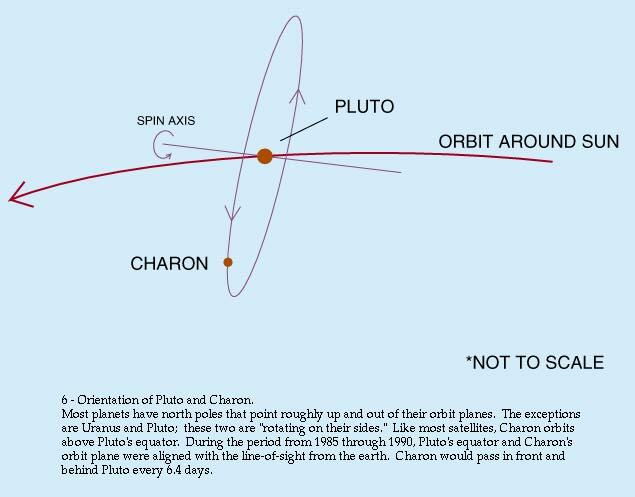 The satellites' orbits are circular (eccentricity < 0.006) and coplanar with Pluto's equator (inclination < 1°), and therefore tilted approximately 120° relative to Pluto's orbit. The Plutonian system is highly compact: the five known satellites orbit within the inner 3% of the region where prograde orbits would be stable. An oblique view of the Pluto–Charon system showing that Pluto orbits a point outside itself. The two bodies are mutually tidally locked. The Pluto–Charon system is one of the few in the Solar System whose barycenter lies outside the primary body; the Patroclus–Menoetius system is a smaller example, and the Sun–Jupiter system is the only larger one. The similarity in size of Charon and Pluto has prompted some astronomers to call it a double dwarf planet. The system is also unusual among planetary systems in that each is tidally locked to the other, which means that Pluto and Charon always have the same hemisphere facing each other. From any position on either body, the other is always at the same position in the sky, or always obscured. This also means that the rotation period of each is equal to the time it takes the entire system to rotate around its barycenter. Pluto's moons are hypothesized to have been formed by a collision between Pluto and a similar-sized body, early in the history of the Solar System. The collision released material that consolidated into the moons around Pluto. Pluto's true place in the Solar System began to reveal itself only in 1992, when astronomers began to find small icy objects beyond Neptune that were similar to Pluto not only in orbit but also in size and composition. This trans-Neptunian population is thought to be the source of many short-period comets. Pluto is now known to be the largest member of the Kuiper belt,[j] a stable belt of objects located between 30 and 50 AU from the Sun. As of 2011, surveys of the Kuiper belt to magnitude 21 were nearly complete and any remaining Pluto-sized objects are expected to be beyond 100 AU from the Sun. Like other Kuiper-belt objects (KBOs), Pluto shares features with comets; for example, the solar wind is gradually blowing Pluto's surface into space. It has been claimed that if Pluto were placed as near to the Sun as Earth, it would develop a tail, as comets do. This claim has been disputed with the argument that Pluto's escape velocity is too high for this to happen. Nonetheless, it has also been claimed that Pluto may have formed as a result of the agglomeration of numerous comets and related Kuiper belt objects. New Horizons made its closest approach to Pluto on July 14, 2015, after a 3,462-day journey across the Solar System. Scientific observations of Pluto began five months before the closest approach and continued for at least a month after the encounter. Observations were conducted using a remote sensing package that included imaging instruments and a radio science investigation tool, as well as spectroscopic and other experiments. The scientific goals of New Horizons were to characterize the global geology and morphology of Pluto and its moon Charon, map their surface composition, and analyze Pluto's neutral atmosphere and its escape rate. On October 25, 2016, at 05:48 pm ET, the last bit of data (of a total of 50 billion bits of data; or 6.25 gigabytes) was received from New Horizons from its close encounter with Pluto. Since the New Horizons flyby, scientists have advocated for an orbiter mission that would return to Pluto to fulfill new science objectives. They include mapping the surface at 30 feet per pixel, observations of Pluto's smaller satellites, observations of how Pluto changes as it rotates on its axis, and topographic mapping of Pluto's regions that are covered in long-term darkness due to its axial tilt. The last objective could be accomplished using laser pulses to generate a complete topographic map of Pluto. New Horizons principal investigator Alan Stern has advocated for a Cassini-style orbiter that would launch around 2030 (the 100th anniversary of Pluto's discovery) and use Charon's gravity to adjust its orbit as needed to fulfill science objectives after arriving at the Pluto system. The orbiter could then use Charon's gravity to leave the Pluto system and study more KBOs after all Pluto science objectives are completed. A conceptual study funded by the NASA Innovative Advanced Concepts (NIAC) program describes a fusion-enabled Pluto orbiter and lander based on the Princeton field-reversed configuration reactor. ^ This photograph was taken by the Ralph telescope aboard New Horizons on July 14, 2015 from a distance of 35,445 km (22,025 mi). The most prominent feature in the image, the bright, youthful plains of Tombaugh Regio and Sputnik Planitia, can be seen at right. It contrasts the darker, more cratered terrain of Cthulhu Macula at lower left. Because of Pluto's 119.591° tilt at its axis, the southern hemisphere is barely visible in this image; the equator runs through Cthulhu Macula and the southern parts of Sputnik Planitia. ^ The mean elements here are from the Theory of the Outer Planets (TOP2013) solution by the Institut de mécanique céleste et de calcul des éphémérides (IMCCE). They refer to the standard equinox J2000, the barycenter of the Solar System, and the epoch J2000. ^ The equivalence is less close in languages whose phonology differs widely from Greek's, such as Somali Buluuto and Navajo Tłóotoo. ^ The discovery of Charon in 1978 allowed astronomers to accurately calculate the mass of the Plutonian system. But it did not indicate the two bodies' individual masses, which could only be estimated after other moons of Pluto were discovered in late 2005. As a result, because Pluto came to perihelion in 1989, most Pluto perihelion date estimates are based on the Pluto–Charon barycenter. Charon came to perihelion 4 September 1989. The Pluto–Charon barycenter came to perihelion 5 September 1989. Pluto came to perihelion 8 September 1989. ^ The dwarf planet Eris is roughly the same size as Pluto, about 2330 km; Eris is 28% more massive than Pluto. Eris is a scattered-disc object, often considered a distinct population from Kuiper-belt objects like Pluto; Pluto is the largest body in the Kuiper belt proper, which excludes the scattered-disc objects. ^ a b c d e f g h i j k l Williams, David R. (July 24, 2015). "Pluto Fact Sheet". NASA. Retrieved August 6, 2015. ^ Simon, J.L. ; Francou, G.; Fienga, A.; Manche, H. (September 2013). "New analytical planetary theories VSOP2013 and TOP2013". Astronomy and Astrophysics. 557 (2): A49. Bibcode:2013A&A...557A..49S. doi:10.1051/0004-6361/201321843. The elements in the clearer and usual format is in the spreadsheet and the original TOP2013 elements here. ^ a b c d Stern, S. A.; Grundy, W.; McKinnon, W. B.; Weaver, H. A.; Young, L. A. (2017). "The Pluto System After New Horizons". Annual Review of Astronomy and Astrophysics. 2018: 357–392. arXiv:1712.05669. doi:10.1146/annurev-astro-081817-051935. ^ a b c d e Nimmo, Francis; et al. (2017). "Mean radius and shape of Pluto and Charon from New Horizons images". Icarus. 287: 12–29. arXiv:1603.00821. Bibcode:2017Icar..287...12N. doi:10.1016/j.icarus.2016.06.027. ^ a b c d e f g h i Stern, S. A.; et al. (2015). "The Pluto system: Initial results from its exploration by New Horizons". Science. 350 (6258): 249–352. arXiv:1510.07704. Bibcode:2015Sci...350.1815S. doi:10.1126/science.aad1815. PMID 26472913. ^ a b Archinal, Brent A.; A'Hearn, Michael F.; Bowell, Edward G.; Conrad, Albert R.; Consolmagno, Guy J.; et al. (2010). "Report of the IAU Working Group on Cartographic Coordinates and Rotational Elements: 2009" (PDF). Celestial Mechanics and Dynamical Astronomy. 109 (2): 101–135. Bibcode:2011CeMDA.109..101A. doi:10.1007/s10569-010-9320-4. Archived from the original (PDF) on March 4, 2016. Retrieved September 26, 2018. ^ Hamilton, Calvin J. (February 12, 2006). "Dwarf Planet Pluto". Views of the Solar System. Retrieved January 10, 2007. ^ "AstDys (134340) Pluto Ephemerides". Department of Mathematics, University of Pisa, Italy. Retrieved June 27, 2010. ^ "JPL Small-Body Database Browser: 134340 Pluto". Retrieved June 12, 2008. ^ "Pluto has carbon monoxide in its atmosphere". Physorg.com. April 19, 2011. Retrieved November 22, 2011. ^ Croswell, Ken (1997). Planet Quest: The Epic Discovery of Alien Solar Systems. New York: The Free Press. p. 43. ISBN 978-0-684-83252-4. ^ a b c Tombaugh, Clyde W. (1946). "The Search for the Ninth Planet, Pluto". Astronomical Society of the Pacific Leaflets. 5 (209): 73–80. Bibcode:1946ASPL....5...73T. ^ a b c Hoyt, William G. (1976). "W. H. Pickering's Planetary Predictions and the Discovery of Pluto". Isis. 67 (4): 551–564. doi:10.1086/351668. JSTOR 230561. ^ Littman, Mark (1990). Planets Beyond: Discovering the Outer Solar System. Wiley. p. 70. ISBN 978-0-471-51053-6. ^ Buchwald, Greg; Dimario, Michael; Wild, Walter (2000). Pluto is Discovered Back in Time. Amateur–Professional Partnerships in Astronomy. 220. San Francisco. p. 335. Bibcode:2000ASPC..220..355B. ISBN 978-1-58381-052-1. ^ a b Croswell 1997, p. 50. ^ Croswell 1997, p. 52. ^ "11 awesome facts about Pluto that you probably don't know". Geek.com. July 24, 2015. Retrieved February 6, 2019. ^ For example: "Ninth Planet Discovered on Edge of Solar System: First Found in 84 Years". Associated Press. The New York Times. March 14, 1930. p. 1. ^ a b Rao, Joe (March 11, 2005). "Finding Pluto: Tough Task, Even 75 Years Later". Space.com. Retrieved September 8, 2006. ^ Mager, Brad. "The Search Continues". Pluto: The Discovery of Planet X. Retrieved November 29, 2011. ^ a b c d Rincon, Paul (January 13, 2006). "The girl who named a planet". BBC News. Retrieved April 12, 2007. ^ Croswell 1997, pp. 54–55. ^ "Pluto Research at Lowell". Lowell Observatory. Archived from the original on April 18, 2016. Retrieved March 22, 2017. In a Lowell Observatory Circular dated May 1, 1930, the Observatory designated Pluto as the name for the new planet, based on the suggestion of 11-year-old Venetia Burney of England. ^ "NASA's Solar System Exploration: Multimedia: Gallery: Pluto's Symbol". NASA. Archived from the original on October 1, 2006. Retrieved November 29, 2011. ^ Heinrichs, Allison M. (2006). "Dwarfed by comparison". Pittsburgh Tribune-Review. Archived from the original on November 14, 2007. Retrieved March 26, 2007. ^ Clark, David L.; Hobart, David E. (2000). "Reflections on the Legacy of a Legend" (PDF). Retrieved November 29, 2011. ^ Renshaw, Steve; Ihara, Saori (2000). "A Tribute to Houei Nojiri". Archived from the original on December 6, 2012. Retrieved November 29, 2011. ^ a b c "Planetary Linguistics". Archived from the original on December 17, 2007. Retrieved June 12, 2007. ^ Bathrobe. "Uranus, Neptune, and Pluto in Chinese, Japanese, and Vietnamese". cjvlang.com. Archived from the original on August 20, 2011. Retrieved November 29, 2011. ^ Stern, Alan; Tholen, David James (1997). Pluto and Charon. University of Arizona Press. pp. 206–208. ISBN 978-0-8165-1840-1. ^ Crommelin, Andrew Claude de la Cherois (1931). "The Discovery of Pluto". Monthly Notices of the Royal Astronomical Society. 91 (4): 380–385. Bibcode:1931MNRAS..91..380.. doi:10.1093/mnras/91.4.380. ^ a b Nicholson, Seth B.; Mayall, Nicholas U. (December 1930). "The Probable Value of the Mass of Pluto". Publications of the Astronomical Society of the Pacific. 42 (250): 350. Bibcode:1930PASP...42..350N. doi:10.1086/124071. ^ Nicholson, Seth B.; Mayall, Nicholas U. (January 1931). "Positions, Orbit, and Mass of Pluto". Astrophysical Journal. 73: 1. Bibcode:1931ApJ....73....1N. doi:10.1086/143288. ^ a b Kuiper, Gerard P. (1950). "The Diameter of Pluto". Publications of the Astronomical Society of the Pacific. 62 (366): 133–137. Bibcode:1950PASP...62..133K. doi:10.1086/126255. ^ a b Croswell 1997, p. 57. ^ Christy, James W.; Harrington, Robert Sutton (1978). "The Satellite of Pluto". Astronomical Journal. 83 (8): 1005–1008. Bibcode:1978AJ.....83.1005C. doi:10.1086/112284. ^ a b Buie, Marc W.; Grundy, William M.; Young, Eliot F.; et al. (2006). 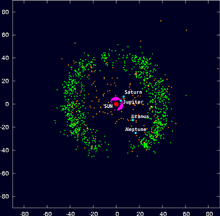 "Orbits and photometry of Pluto's satellites: Charon, S/2005 P1, and S/2005 P2". Astronomical Journal. 132 (1): 290–298. arXiv:astro-ph/0512491. Bibcode:2006AJ....132..290B. doi:10.1086/504422. ^ Seidelmann, P. Kenneth; Harrington, Robert Sutton (1988). "Planet X – The current status". Celestial Mechanics and Dynamical Astronomy. 43 (1–4): 55–68. Bibcode:1987CeMec..43...55S. doi:10.1007/BF01234554. Retrieved November 29, 2011. ^ a b Standish, E. Myles (1993). "Planet X – No dynamical evidence in the optical observations". Astronomical Journal. 105 (5): 200–2006. Bibcode:1993AJ....105.2000S. doi:10.1086/116575. ^ Standage, Tom (2000). The Neptune File. Penguin. p. 168. ISBN 978-0-8027-1363-6. ^ "History I: The Lowell Observatory in 20th century Astronomy". The Astronomical Society of the Pacific. June 28, 1994. Retrieved November 29, 2011. ^ Tyson, Neil deGrasse (February 2, 2001). "Astronomer Responds to Pluto-Not-a-Planet Claim". Space.com. Retrieved November 30, 2011. ^ "NASA-Funded Scientists Discover Tenth Planet". NASA press releases. July 29, 2005. Retrieved February 22, 2007. ^ Soter, Steven (November 2, 2006). "What Is a Planet?". The Astronomical Journal. 132 (6): 2513–2519. arXiv:astro-ph/0608359. Bibcode:2006AJ....132.2513S. doi:10.1086/508861. ^ "IAU 2006 General Assembly: Resolutions 5 and 6" (PDF). IAU. August 24, 2006. ^ a b "IAU 2006 General Assembly: Result of the IAU Resolution votes". International Astronomical Union (News Release – IAU0603). August 24, 2006. Retrieved June 15, 2008. ^ Margot, Jean-Luc (2015). "A QUANTITATIVE CRITERION FOR DEFINING PLANETS". The Astronomical Journal. 150 (6): 185. arXiv:1507.06300. Bibcode:2015AJ....150..185M. doi:10.1088/0004-6256/150/6/185. ^ Soter, Steven (2007). "What is a Planet?". The Astronomical Journal. Department of Astrophysics, American Museum of Natural History. 132 (6): 2513–2519. arXiv:astro-ph/0608359. Bibcode:2006AJ....132.2513S. doi:10.1086/508861. ^ Green, Daniel W. E. (September 13, 2006). "(134340) Pluto, (136199) Eris, and (136199) Eris I (Dysnomia)" (PDF). IAU Circular. 8747: 1. Bibcode:2006IAUC.8747....1G. Archived from the original on February 5, 2007. Retrieved December 1, 2011. ^ "JPL Small-Body Database Browser". California Institute of Technology. Retrieved July 15, 2015. ^ Britt, Robert Roy (August 24, 2006). "Pluto Demoted: No Longer a Planet in Highly Controversial Definition". Space.com. Archived from the original on August 20, 2011. Retrieved September 8, 2006. ^ Ruibal, Sal (January 6, 1999). "Astronomers question if Pluto is real planet". USA Today. ^ Britt, Robert Roy (November 21, 2006). "Why Planets Will Never Be Defined". Space.com. Retrieved December 1, 2006. ^ Britt, Robert Roy (August 24, 2006). "Scientists decide Pluto's no longer a planet". MSNBC. Retrieved September 8, 2006. ^ a b Shiga, David (August 25, 2006). "New planet definition sparks furore". NewScientist.com. Retrieved September 8, 2006. ^ "Should Large Moons Be Called 'Satellite Planets'?". News.discovery.com. May 14, 2010. Retrieved November 4, 2011. ^ Buie, Marc W. (September 2006). "My response to 2006 IAU Resolutions 5a and 6a". Southwest Research Institute. Archived from the original on June 3, 2007. Retrieved December 1, 2011. ^ Overbye, Dennis (August 24, 2006). "Pluto Is Demoted to 'Dwarf Planet'". The New York Times. Retrieved December 1, 2011. ^ DeVore, Edna (September 7, 2006). "Planetary Politics: Protecting Pluto". Space.com. Retrieved December 1, 2011. ^ Holden, Constance (March 23, 2007). "Rehabilitating Pluto". Science. 315 (5819): 1643. doi:10.1126/science.315.5819.1643c. ^ Gutierrez, Joni Marie (2007). "A joint memorial. Declaring Pluto a planet and declaring March 13, 2007, 'Pluto planet day' at the legislature". Legislature of New Mexico. Retrieved September 5, 2009. ^ "Illinois General Assembly: Bill Status of SR0046, 96th General Assembly". ilga.gov. Illinois General Assembly. Retrieved March 16, 2011. ^ "Pluto's still the same Pluto". Independent Newspapers. Associated Press. October 21, 2006. Retrieved November 29, 2011. Mickey Mouse has a cute dog. ^ "'Plutoed' chosen as '06 Word of the Year". Associated Press. January 8, 2007. Retrieved January 10, 2007. ^ Minkel, J. R. (April 10, 2008). "Is Rekindling the Pluto Planet Debate a Good Idea?". Scientific American. Retrieved December 1, 2011. ^ "The Great Planet Debate: Science as Process. A Scientific Conference and Educator Workshop". gpd.jhuapl.edu. Johns Hopkins University Applied Physics Laboratory. June 27, 2008. Retrieved December 1, 2011. ^ "Plutoid chosen as name for Solar System objects like Pluto". Paris: International Astronomical Union (News Release – IAU0804). June 11, 2008. Retrieved December 1, 2011. ^ "Pluto to become most distant planet". JPL/NASA. January 28, 1999. Retrieved January 16, 2011. ^ Sussman, Gerald Jay; Wisdom, Jack (1988). "Numerical evidence that the motion of Pluto is chaotic". Science. 241 (4864): 433–437. Bibcode:1988Sci...241..433S. doi:10.1126/science.241.4864.433. PMID 17792606. ^ Wisdom, Jack; Holman, Matthew (1991). "Symplectic maps for the n-body problem". Astronomical Journal. 102: 1528–1538. Bibcode:1991AJ....102.1528W. doi:10.1086/115978. ^ a b c d Williams, James G.; Benson, G. S. (1971). "Resonances in the Neptune-Pluto System". Astronomical Journal. 76: 167. Bibcode:1971AJ.....76..167W. doi:10.1086/111100. ^ a b c d Wan, Xiao-Sheng; Huang, Tian-Yi; Innanen, Kim A. (2001). "The 1:1 Superresonance in Pluto's Motion". The Astronomical Journal. 121 (2): 1155–1162. Bibcode:2001AJ....121.1155W. doi:10.1086/318733. ^ Hunter, Maxwell W. (2004). "Unmanned scientific exploration throughout the Solar System". Space Science Reviews. 6 (5): 501. Bibcode:1967SSRv....6..601H. doi:10.1007/BF00168793. ^ a b c d Malhotra, Renu (1997). "Pluto's Orbit". Retrieved March 26, 2007. ^ a b c Alfvén, Hannes; Arrhenius, Gustaf (1976). "SP-345 Evolution of the Solar System". Retrieved March 28, 2007. ^ Cohen, C. J.; Hubbard, E. C. (1965). "Libration of the close approaches of Pluto to Neptune". Astronomical Journal. 70: 10. Bibcode:1965AJ.....70...10C. doi:10.1086/109674. ^ a b de la Fuente Marcos, Carlos; de la Fuente Marcos, Raúl (2012). "Plutino 15810 (1994 JR1), an accidental quasi-satellite of Pluto". Monthly Notices of the Royal Astronomical Society Letters. 427 (1): L85. arXiv:1209.3116. Bibcode:2012MNRAS.427L..85D. doi:10.1111/j.1745-3933.2012.01350.x. ^ "Pluto's fake moon". September 24, 2012. Retrieved September 24, 2012. ^ a b "New Horizons Collects First Science on a Post-Pluto Object". NASA. May 13, 2016. ^ Porter, Simon B.; et al. (2016). "The First High-phase Observations of a KBO: New Horizons Imaging of (15810) 1994 JR1 from the Kuiper Belt". The Astrophysical Journal Letters. 828 (2): L15. arXiv:1605.05376. Bibcode:2016ApJ...828L..15P. doi:10.3847/2041-8205/828/2/L15. ^ a b Faure, Gunter; Mensing, Teresa M. (2007). Pluto and Charon: The Odd Couple. Introduction to Planetary Science. Springer. pp. 401–408. doi:10.1007/978-1-4020-5544-7. ISBN 978-1-4020-5544-7. ^ Kirschvink, Joseph L.; Ripperdan, Robert L.; Evans, David A. (July 25, 1997). "Evidence for a Large-Scale Reorganization of Early Cambrian Continental Masses by Inertial Interchange True Polar Wander". Science. 277 (5325): 541–545. doi:10.1126/science.277.5325.541. ISSN 0036-8075. ^ Keane, James T.; Matsuyama, Isamu; Kamata, Shunichi; Steckloff, Jordan K. (2016). "Reorientation and faulting of Pluto due to volatile loading within Sputnik Planitia". Nature. 540 (7631): 90–93. Bibcode:2016Natur.540...90K. doi:10.1038/nature20120. PMID 27851731. ^ a b Owen, Tobias C.; Roush, Ted L.; Cruikshank, Dale P.; et al. (1993). "Surface Ices and the Atmospheric Composition of Pluto". Science. 261 (5122): 745–748. Bibcode:1993Sci...261..745O. doi:10.1126/science.261.5122.745. JSTOR 2882241. PMID 17757212. ^ Grundy, W. M.; Olkin, C. B.; Young, L. A.; Buie, M. W.; Young, E. F. (2013). "Near-infrared spectral monitoring of Pluto's ices: Spatial distribution and secular evolution" (PDF). Icarus. 223 (2): 710–721. arXiv:1301.6284. Bibcode:2013Icar..223..710G. doi:10.1016/j.icarus.2013.01.019. Archived from the original (PDF) on November 8, 2015. ^ Drake, Nadia (November 9, 2015). "Floating Mountains on Pluto – You Can't Make This Stuff Up". National Geographic. Retrieved December 23, 2016. ^ Buie, Marc W.; Grundy, William M.; Young, Eliot F.; et al. (2010). "Pluto and Charon with the Hubble Space Telescope: I. Monitoring global change and improved surface properties from light curves". Astronomical Journal. 139 (3): 1117–1127. Bibcode:2010AJ....139.1117B. CiteSeerX 10.1.1.625.7795. doi:10.1088/0004-6256/139/3/1117. 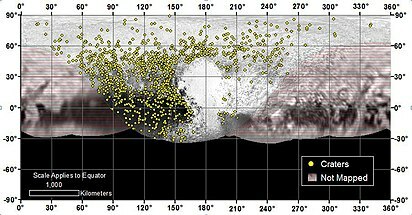 ^ a b Buie, Marc W. "Pluto map information". Archived from the original on June 29, 2011. Retrieved February 10, 2010. ^ Villard, Ray; Buie, Marc W. (February 4, 2010). "New Hubble Maps of Pluto Show Surface Changes". News Release Number: STScI-2010-06. Retrieved February 10, 2010. ^ a b Buie, Marc W.; Grundy, William M.; Young, Eliot F.; et al. (2010). "Pluto and Charon with the Hubble Space Telescope: II. Resolving changes on Pluto's surface and a map for Charon". Astronomical Journal. 139 (3): 1128–1143. Bibcode:2010AJ....139.1128B. doi:10.1088/0004-6256/139/3/1128. ^ Lakdawalla, Emily (October 26, 2016). "DPS/EPSC update on New Horizons at the Pluto system and beyond". The Planetary Society. Retrieved October 26, 2016. ^ McKinnon, W. B.; Nimmo, F.; Wong, T.; Schenk, P. M.; White, O. L.; et al. (June 1, 2016). "Convection in a volatile nitrogen-ice-rich layer drives Pluto's geological vigour". Nature. 534 (7605): 82–85. Bibcode:2016Natur.534...82M. doi:10.1038/nature18289. PMID 27251279. ^ Trowbridge, A. J.; Melosh, H. J.; Steckloff, J. K.; Freed, A. M. (June 1, 2016). "Vigorous convection as the explanation for Pluto's polygonal terrain". Nature. 534 (7605): 79–81. Bibcode:2016Natur.534...79T. doi:10.1038/nature18016. PMID 27251278. ^ Lakdawalla, Emily (December 21, 2015). "Pluto updates from AGU and DPS: Pretty pictures from a confusing world". The Planetary Society. Retrieved January 24, 2016. ^ Umurhan, O. (January 8, 2016). 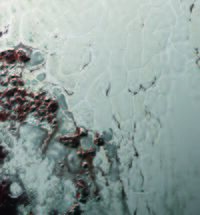 "Probing the Mysterious Glacial Flow on Pluto's Frozen 'Heart'". blogs.nasa.gov. NASA. Retrieved January 24, 2016. ^ Marchis, F.; Trilling, D. E. (January 20, 2016). "The Surface Age of Sputnik Planum, Pluto, Must Be Less than 10 Million Years". PLoS ONE. 11 (1): e0147386. arXiv:1601.02833. Bibcode:2016PLoSO..1147386T. doi:10.1371/journal.pone.0147386. PMC 4720356. PMID 26790001. ^ Buhler, P. B.; Ingersoll, A. P. (March 23, 2017). "Sublimation pit distribution indicates convection cell surface velocity of ~10 centimeters per year in Sputnik Planitia, Pluto" (PDF). 48th Lunar and Planetary Science Conference. ^ Telfer, Matt W; Parteli, Eric J. R; Radebaugh, Jani; Beyer, Ross A; Bertrand, Tanguy; Forget, François; Nimmo, Francis; Grundy, Will M; Moore, Jeffrey M; Stern, S. Alan; Spencer, John; Lauer, Tod R; Earle, Alissa M; Binzel, Richard P; Weaver, Hal A; Olkin, Cathy B; Young, Leslie A; Ennico, Kimberly; Runyon, Kirby (2018). "Dunes on Pluto". Science. 360 (6392): 992–997. Bibcode:2018Sci...360..992T. doi:10.1126/science.aao2975. PMID 29853681. ^ "The Inside Story". pluto.jhuapl.edu – NASA New Horizons mission site. Johns Hopkins University Applied Physics Laboratory. 2007. Archived from the original on August 20, 2011. Retrieved February 15, 2014. ^ Overlooked Ocean Worlds Fill the Outer Solar System. John Wenz, Scientific American. October 4, 2017. ^ Samantha Cole. "An Incredibly Deep Ocean Could Be Hiding Beneath Pluto's Icy Heart". Popular Science. Retrieved September 24, 2016. ^ NASA (September 14, 2016). "X-ray Detection Sheds New Light on Pluto". nasa.gov. Retrieved December 3, 2016. ^ Millis, Robert L.; Wasserman, Lawrence H.; Franz, Otto G.; et al. (1993). "Pluto's radius and atmosphere – Results from the entire 9 June 1988 occultation data set". Icarus. 105 (2): 282–297. Bibcode:1993Icar..105..282M. doi:10.1006/icar.1993.1126. ^ Young, Eliot F.; Binzel, Richard P. (1994). "A new determination of radii and limb parameters for Pluto and Charon from mutual event lightcurves". Icarus. 108 (2): 219–224. Bibcode:1994Icar..108..219Y. doi:10.1006/icar.1994.1056. ^ a b Young, Eliot F.; Young, Leslie A.; Buie, Marc W. (2007). "Pluto's Radius". American Astronomical Society, DPS Meeting No. 39, #62.05; Bulletin of the American Astronomical Society. 39: 541. Bibcode:2007DPS....39.6205Y. ^ Zalucha, Angela M.; Gulbis, Amanda A. S.; Zhu, Xun; et al. (2011). "An analysis of Pluto occultation light curves using an atmospheric radiative-conductive model". Icarus. 211 (1): 804–818. Bibcode:2011Icar..211..804Z. doi:10.1016/j.icarus.2010.08.018. ^ a b Lellouch, Emmanuel; de Bergh, Catherine; Sicardy, Bruno; et al. (January 15, 2015). "Exploring the spatial, temporal, and vertical distribution of methane in Pluto's atmosphere". Icarus. 246: 268–278. arXiv:1403.3208. Bibcode:2015Icar..246..268L. doi:10.1016/j.icarus.2014.03.027. ^ Davies, John (2001). "Beyond Pluto (extract)" (PDF). Royal Observatory, Edinburgh. Retrieved March 26, 2007. ^ Close, Laird M.; Merline, William J.; Tholen, David J.; et al. (2000). "Adaptive optics imaging of Pluto–Charon and the discovery of a moon around the Asteroid 45 Eugenia: the potential of adaptive optics in planetary astronomy". Proceedings of the International Society for Optical Engineering. Adaptive Optical Systems Technology. 4007: 787–795. Bibcode:2000SPIE.4007..787C. doi:10.1117/12.390379. ^ a b "How Big Is Pluto? New Horizons Settles Decades-Long Debate". NASA. July 13, 2015. Retrieved July 13, 2015. ^ Lakdawalla, Emily (July 13, 2015). "Pluto minus one day: Very first New Horizons Pluto encounter science results". The Planetary Society. Retrieved July 13, 2015. ^ "Conditions on Pluto: Incredibly Hazy With Flowing Ice". New York Times. July 24, 2015. Retrieved July 24, 2015. ^ Croswell, Ken (1992). "Nitrogen in Pluto's Atmosphere". KenCroswell.com. New Scientist. Retrieved April 27, 2007. ^ Olkin, C. B.; Young, L. A.; Borncamp, D.; et al. (January 2015). "Evidence that Pluto's atmosphere does not collapse from occultations including the 2013 May 04 event". Icarus. 246: 220–225. Bibcode:2015Icar..246..220O. doi:10.1016/j.icarus.2014.03.026. ^ a b c d e Kelly Beatty (2016). "Pluto's Atmosphere Confounds Researchers". Sky & Telescope. Retrieved April 2, 2016. ^ Than, Ker (2006). "Astronomers: Pluto colder than expected". Space.com (via CNN.com). Retrieved November 30, 2011. ^ Lellouch, Emmanuel; Sicardy, Bruno; de Bergh, Catherine; et al. (2009). "Pluto's lower atmosphere structure and methane abundance from high-resolution spectroscopy and stellar occultations". Astronomy and Astrophysics. 495 (3): L17–L21. arXiv:0901.4882. Bibcode:2009A&A...495L..17L. doi:10.1051/0004-6361/200911633. ^ Gugliotta, Guy (November 1, 2005). "Possible New Moons for Pluto". Washington Post. Retrieved October 10, 2006. ^ "NASA's Hubble Discovers Another Moon Around Pluto". NASA. July 20, 2011. Retrieved July 20, 2011. ^ Wall, Mike (July 11, 2012). "Pluto Has a Fifth Moon, Hubble Telescope Reveals". Space.com. Retrieved July 11, 2012. ^ Buie, M.; Tholen, D.; Grundy, W. (2012). "The Orbit of Charon is Circular". The Astronomical Journal. 144 (1): 15. Bibcode:2012AJ....144...15B. doi:10.1088/0004-6256/144/1/15. ^ a b c d Showalter, M. R.; Hamilton, D. P. (June 3, 2015). "Resonant interactions and chaotic rotation of Pluto's small moons". Nature. 522 (7554): 45–49. Bibcode:2015Natur.522...45S. doi:10.1038/nature14469. PMID 26040889. ^ Stern, S. Alan; Weaver, Harold A., Jr.; Steffl, Andrew J.; et al. (2005). "Characteristics and Origin of the Quadruple System at Pluto". Submitted to Nature: arXiv:astro–ph/0512599. arXiv:astro-ph/0512599. Bibcode:2005astro.ph.12599S. ^ Matson, J. (July 11, 2012). "New Moon for Pluto: Hubble Telescope Spots a 5th Plutonian Satellite". Scientific American web site. Retrieved July 12, 2012. ^ Richardson, Derek C.; Walsh, Kevin J. (2005). "Binary Minor Planets". Annual Review of Earth and Planetary Sciences. 34 (1): 47–81. Bibcode:2006AREPS..34...47R. doi:10.1146/annurev.earth.32.101802.120208. ^ Sicardy, Bruno; Bellucci, Aurélie; Gendron, Éric; et al. (2006). "Charon's size and an upper limit on its atmosphere from a stellar occultation". Nature. 439 (7072): 52–54. Bibcode:2006Natur.439...52S. doi:10.1038/nature04351. PMID 16397493. ^ Young, Leslie A. (1997). "The Once and Future Pluto". Southwest Research Institute, Boulder, Colorado. Retrieved March 26, 2007. ^ "Charon: An ice machine in the ultimate deep freeze". Gemini Observatory News Release. 2007. Retrieved July 18, 2007. ^ "NASA's Hubble Finds Pluto's Moons Tumbling in Absolute Chaos". June 3, 2015. Retrieved June 3, 2015. ^ "Hubble Finds Two Chaotically Tumbling Pluto Moons". hubblesite.org. HubbleSite – NewsCenter. June 3, 2015. Retrieved June 3, 2015. ^ Stern, S. Alan; Tholen, David J. (1997). Pluto and Charon. University of Arizona Press. p. 623. ISBN 978-0-8165-1840-1. ^ Sheppard, Scott S.; Trujillo, Chadwick A.; Udalski, Andrzej; et al. (2011). "A Southern Sky and Galactic Plane Survey for Bright Kuiper Belt Objects". Astronomical Journal. 142 (4): 98. arXiv:1107.5309. Bibcode:2011AJ....142...98S. doi:10.1088/0004-6256/142/4/98. ^ "Colossal Cousin to a Comet?". pluto.jhuapl.edu – NASA New Horizons mission site. Johns Hopkins University Applied Physics Laboratory. Archived from the original on November 13, 2014. Retrieved February 15, 2014. ^ Tyson, Neil deGrasse (1999). "Pluto Is Not a Planet". The Planetary Society. Archived from the original on September 27, 2011. Retrieved November 30, 2011. ^ Wall, Mike (May 24, 2018). "Pluto May Have Formed from 1 Billion Comets". Space.com. Retrieved May 24, 2018. ^ Glein, Christopher R.; Waite, Jr, J. Hunter (May 24, 2018). "Primordial N2 provides a cosmochemical explanation for the existence of Sputnik Planitia, Pluto". Icarus. 313 (2018): 79–92. arXiv:1805.09285. Bibcode:2018Icar..313...79G. doi:10.1016/j.icarus.2018.05.007. ^ "Neptune's Moon Triton". The Planetary Society. Archived from the original on December 10, 2011. Retrieved November 30, 2011. ^ Jewitt, David C. (2004). "The Plutinos". University of Hawaii. Archived from the original on April 19, 2007. Retrieved March 26, 2007. ^ Hahn, Joseph M. (2005). "Neptune's Migration into a Stirred-up Kuiper Belt: A Detailed Comparison of Simulations to Observations" (PDF). The Astronomical Journal. 130 (5): 2392–2414. arXiv:astro-ph/0507319. Bibcode:2005AJ....130.2392H. doi:10.1086/452638. Retrieved March 5, 2008. ^ a b Levison, Harold F.; Morbidelli, Alessandro; Van Laerhoven, Christa; et al. (2007). "Origin of the Structure of the Kuiper Belt during a Dynamical Instability in the Orbits of Uranus and Neptune". Icarus. 196 (1): 258–273. arXiv:0712.0553. Bibcode:2008Icar..196..258L. doi:10.1016/j.icarus.2007.11.035. ^ Talbert, Tricia (March 17, 2016). "Top New Horizons Findings Reported in Science". NASA. Retrieved March 18, 2016. ^ "This month Pluto's apparent magnitude is m=14.1. Could we see it with an 11" reflector of focal length 3400 mm?". Singapore Science Centre. 2002. Archived from the original on November 11, 2005. Retrieved November 29, 2011. ^ Young, Eliot F.; Binzel, Richard P.; Crane, Keenan (2001). "A Two-Color Map of Pluto's Sub-Charon Hemisphere". The Astronomical Journal. 121 (1): 552–561. Bibcode:2001AJ....121..552Y. doi:10.1086/318008. ^ Buie, Marc W.; Tholen, David J.; Horne, Keith (1992). 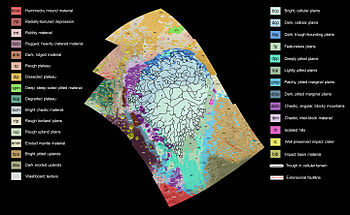 "Albedo maps of Pluto and Charon: Initial mutual event results". Icarus. 97 (2): 221–227. Bibcode:1992Icar...97..211B. doi:10.1016/0019-1035(92)90129-U. ^ a b Buie, Marc W. "How the Pluto maps were made". Archived from the original on February 9, 2010. Retrieved February 10, 2010. ^ "New Horizons, Not Quite to Jupiter, Makes First Pluto Sighting". pluto.jhuapl.edu – NASA New Horizons mission site. Johns Hopkins University Applied Physics Laboratory. November 28, 2006. Archived from the original on March 9, 2011. Retrieved November 29, 2011. ^ Chang, Kenneth (October 28, 2016). "No More Data From Pluto". New York Times. Retrieved October 28, 2016. ^ "Pluto Exploration Complete: New Horizons Returns Last Bits of 2015 Flyby Data to Earth". Johns Hopkins Applied Research Laboratory. October 27, 2016. Retrieved October 28, 2016. ^ Brown, Dwayne; Buckley, Michael; Stothoff, Maria (January 15, 2015). "Release 15-011 – NASA's New Horizons Spacecraft Begins First Stages of Pluto Encounter". NASA. Retrieved January 15, 2015. ^ "New Horizons". pluto.jhuapl.edu. Retrieved May 15, 2016. ^ "Why a group of scientists think we need another mission to Pluto". The Verge. Retrieved July 14, 2018. ^ "Going Back to Pluto? Scientists to Push for Orbiter Mission". Space.com. Retrieved July 14, 2018. ^ Hall, Loura (April 5, 2017). "Fusion-Enabled Pluto Orbiter and Lander". NASA. Retrieved July 14, 2018. ^ Fusion-Enabled Pluto Orbiter and Lander - Phase I Final Report. (PDF) Stephanie Thomas, Princeton Satellite Systems. 2017.